Those were the calls I remember as a teenager when we handpicked hops on August in the early 1930's. Following the depression era, some of our Germans from Russia joined other local migrant workers who harvested berries, beans and hops to supplement the family income. My aunt, Elizabeth Schott Nagel, recruited pickers for the Kaufman farm located at St. Paul, Oregon. She and my four Nagel cousins were among the diligent and dependable pickers for several years. When reminiscing with Walt Nagel, he said his mother was such a competitor, that she could pick 18 to 21 baskets per day. The filled baskets weighed 25 to 30 pounds, and we were always instructed to "pick clean" which meant no leaves or stems mixed in with the hops. Willamette valley hops before harvest. Living in a small rustic cabin away from home was like a camping outing for my mother, Emily Roth Schott, my younger sister, Evelyn, and me. But getting up very early and picking the chilly, dewy rows was a rude awakening. At 1 cent per pound, a long day's work probably netted us around $5. Yet, we were so determined to earn extra money for school clothes and books. We kept a record of our daily tally, and a bonus was given to those who stayed the entire season, which extended into Labor Day. We always looked forward to our Dad, Adam Schott, driving out from Portland on the weekends bringing groceries and news from the neighborhood known as "Slabtown". I can still remember enjoying the delicious fresh green beans shared from Kaufman's vegetable garden. A real treat for us city folks! In the evenings after supper, the young people gathered in the hop house for some visiting, games and sining, and maybe even a little smooching. Early curfews were strictly observed because the crop was waiting to be picked at daybreak. All of our Sundays were observed as a day of worship and rest. Scripture readings, the sharing of devotions and the harmonized favorite hymns restored our souls and weary bodies. My research in an Oregon agricultural book gave this definition: "Hops are known as a perennial vine plant of the nettle family. Grown extensively in the Pacific Northwest, the ripened greenish soft cones when picked and dried, are used in beer to impart flavor and as a preservative value." The vines were trained to grow up tall wires - thus the calls for "WIRE DOWN," when the hops were above our reach. 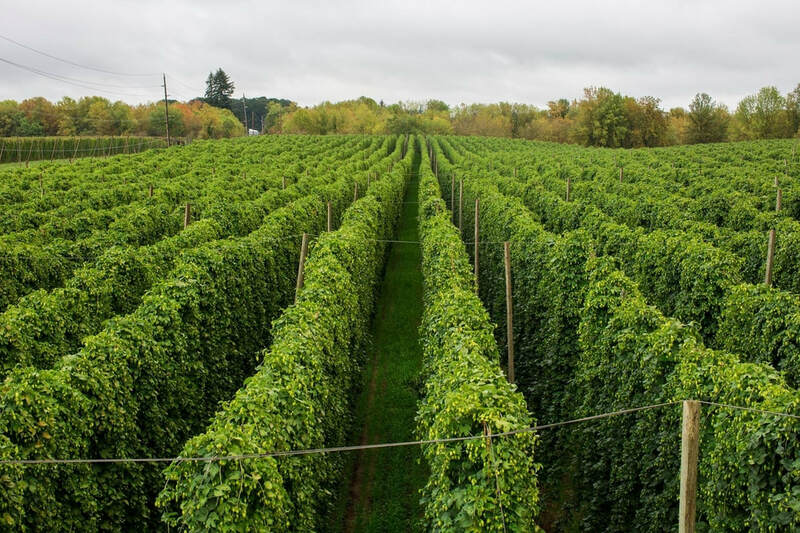 Today the hop industry has evolved into big business with all the microbreweries, pubs, taverns serving countless brands of beer. I'm sure that something unique has been lost in the transition from "hands on picking" to mechanization. But it is a nostalgic recollection of my past that brings back memories of a much treasured ethnic value -- FAMILY TOGETHERNESS! Millar, Virgina Schott. "Wire Down and Weigh "Em Up". AHSGR Oregon Chapter Newsletter. Vol. 21, No. 1. January/February 2000. Last updated July 5, 2018.